Another tone deaf PR campaign does nothing to solve a systemic problem. 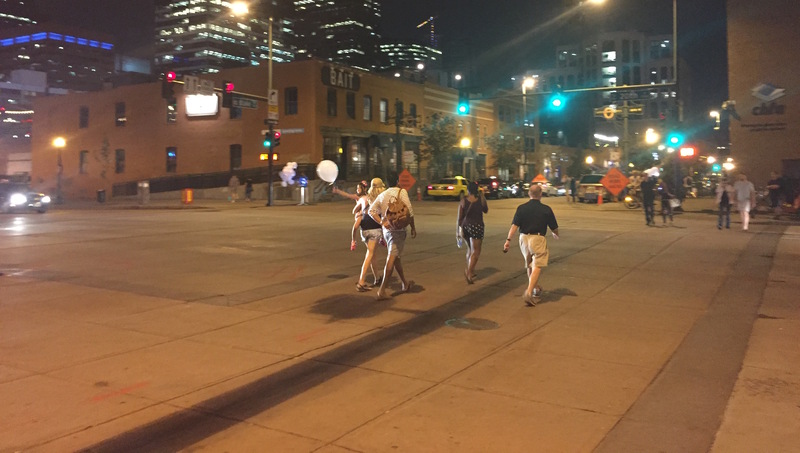 Last night, Colorado DOT reps stood at the same dangerous, high-speed LoDo intersection where a hit-and-run driver killed 26-year-old Steven Glade four days ago and handed balloons to people crossing the street. You see, the white balloons contained LED lights, making people more visible to drivers as they crossed 20th and Blake after the Rockies game. Agency staffers stood at 15th and Larimer doing the same thing. This spectacle was the latest PR event in a string of tone deaf campaigns from CDOT, which oversees the most dangerous streets in Denver. On Federal Boulevard, which the agency controls with the help of Denver Public Works, drivers have killed five people walking this year alone. The campaign cost taxpayers $210,000, Colorado DOT spokesperson Sam Cole told Streetsblog. That money could have prevented more traffic collisions if CDOT had spent it to build a pedestrian island at the deadly intersection of Federal, 14th Avenue, and Howard Place. We know how to make streets safe for walking. We need to redesign streets to calm traffic. We need more and safer crosswalks, shorter pedestrian crossing distances, safer intersection designs, and slimmer traffic lanes that send cues to drivers to stop speeding. What won’t fix the public health crisis of traffic deaths? Cursing the sun for setting each night and handing people balloons. I don’t have any sort of issue with campaigns that remind people on bike or on foot different ways they can take safety into their own hands as long as it’s not the primary focus. When CDOT puts their money where their mouth is by spending on safer bicycle and pedestrian infrastructure instead of prioritizing throughput and automobile speed AND simultaneously remind drivers that we’re out there, that speeding is dangerous, that the speed limit is just that, a limit, and coordinate with local and state police and DA’s to actually enforce existing motor vehicle traffic laws, THEN they can put some effort to these other tactics. Especially agree with your first sentence. CDOT has spent plenty of money on “safer bicycle and pedestrian infrastructure” all over the state as I pointed out on Monday. With respect to Denver the issue gets confused as to what CDOT’s responsibility is and isn’t. But I understand they make a very good Boogie Man. LOL,You and Angie are masters of conflating issues, connecting dots that don’t etc. What’s really too bad is that neither of you make Sean Hannity type money since your rant-ability is just as good. Nice witty finish with a dose of humor even. Yeah totally agree. This campaign has nothing to do with Federal Blvd. On it’s face it’s not even that bad, it is basically saying “hey use a crosswalk” which is valid. It’s not uncommon to see people standing in a median trying to cross a road 50′ away from an intersection with a crosswalk. Saw it at Evans and Monaco just the other day. While most people can make a mid-block crossing safely and without interfering with “by-right” traffic/cars, I assume that engineers focus on the bad behavior, which is difficult to engineer out of society without going to extremes (like putting a fence in the median, physically preventing mid-block crossing). 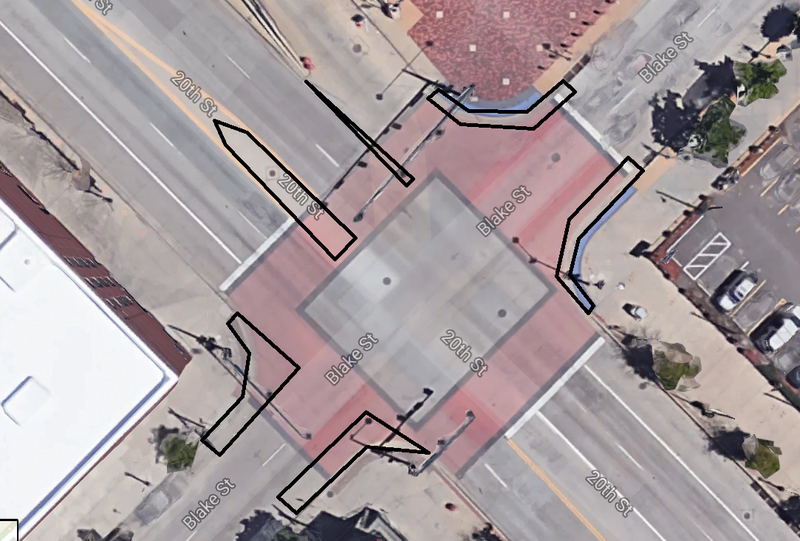 I think a happy medium is to build more designated mid-block crossings. But in my experience as an observer, these often face a lot of scrutiny, and not only from engineers. The sidewalks could easily be widened at 20th & Blake without impeding car traffic. Whoever designed this intersection should be in jail.